Dr. Syed Nadir Hussain obtained his PhD from the University of Manchester, UK in 2012. His area of expertise is based on waste water treatment applications. He has published more than 23 peer reviewed articles in high ranked journals with an overall impact factor of 60. He has an international patent on disinfection of water by adsorption and electrochemical regeneration. He has participated in many international/national conferences and workshops. Dr Syed Hussain completed his graduation in Chemical Engineering from Punjab University in 1997 with distinction. Later on, he did M.Sc (Engg) Chemical Engineering from Punjab University in 2004 and won two gold medals by securing first position. 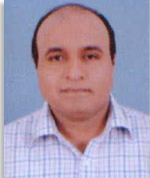 He joined this Institute as Assistant Professor in 2002. Prior to joining as Assistant Professor, he started his professional career in Rupali Polyester Pvt. Ltd which is one of the biggest polyester units of Pakistan. He worked there for about five years in different positions. Presently, he is also working as In-charge industrial trainings at the Institute with the aim to develop a strong linkage between academia and industry along with placement of undergraduate students at prominent process industries for their hands on industrial experience.